If you’re experiencing issues with your septic tank, holding tank, sumps or grease traps, our advanced drainage solutions can clean your system fast and effectively without interfering with any daily operations. Our fully equipped Honeysucker trucks are mobile enough to fit onto small roads and access and service almost any area. The process is precise, having minimal impact on the septic tank which should be cleaned out and serviced regularly to avoid larger maintenance cost implications. A septic tank is a tank found underground in which sewage is collected and allowed to decompose. Decomposition happens through the process of promoting the growth of anaerobic micro-organisms which then partially degrade the waste water before draining by means of a soakaway. 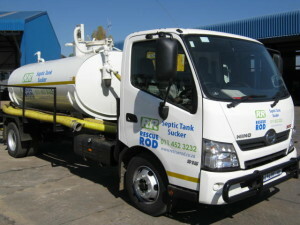 Remove sludge, oils & solid waste from tanks. These industrial vacuum trucks use a strong pneumatic pump to remove the entire contents of the septic tank, which is then taken away and disposed of in an environmentally safe way. Septic tanks can be a great alternative t0 public sewage systems or when someone is simply looking for an efficient water treatment solution. They require very little maintenance making septic tanks extremely economical. Individuals who chose to use a septic tank don’t require extensive training because the system is very simple and easy to operate. It is an excellent alternative for rural communities and industrial buildings, making it well suited to the South African landscape. All septic tank systems require regular maintenance. On average, a septic tank systems must be pumped free of scum and solids annually in order to keep them performing at their peak. Poor Maintenance: a poorly maintained septic system can be a breeding ground for flies and insects that can transmit infectious diseases that can put in danger you and your family’s health. Clogged Drains: oils, fats, grease and other organic compounds thrown into toilets and sinks may cause clogged drains. Toxic Shock: the tank ‘dies’ due to exposure to harsh chemicals, bleach and acid drain cleaners. Capacity Overload – there are too few toilets for the number of people using them. Wash out – when grey water (from the bath, laundry, etc.) or storm water enters the tank and causes excessive hydraulic load. This disrupts the decomposition process of faecal wastes. Sewage Overflow: during rain seasons there is a risk of septic tanks overflowing, bringing sewage to the surface. Bad Odour: foul odours caused by rotting fat and poor maintenance. Read further on the benefits of using Honeysucker Vacuum Trucks for septic tank drainage on Our Technology Page or read more about Rescue Rod’s complete waste management maintenance packages. We only service the Gauteng area.